Isn’t it a great feeling when Friday finally arrives and you’ve got the weekend to look forward to. 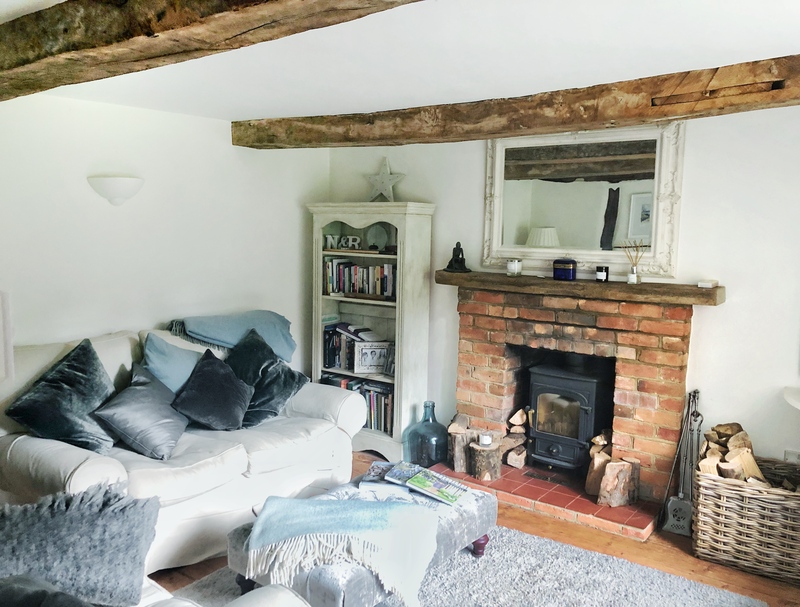 To add to your Friday sunshine, I thought we’d have a treat and take a look around a 200-year-old cottage as it’s something we haven’t come across in terms of property and style here on the blog. It’s the home of Naomi Stuart and her partner and they’ve done an amazing job renovating and bringing back to life the original qualities of this period property. 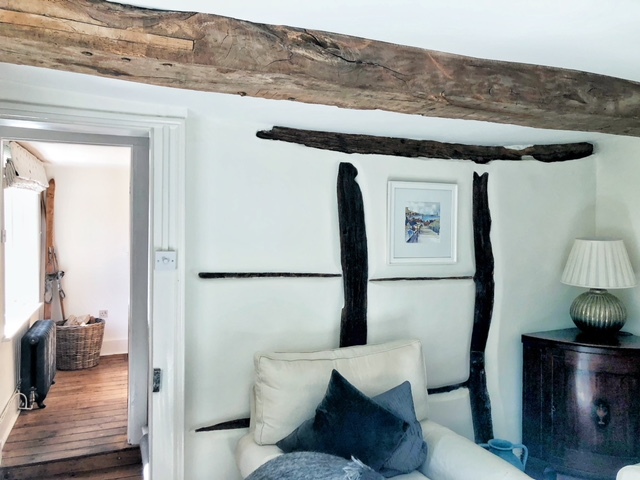 Whilst we might shy away from our natural ageing process seeing wrinkles and imperfections as less than beautiful, the same can not be said about a property that has lived and breathed for over two hundred years. 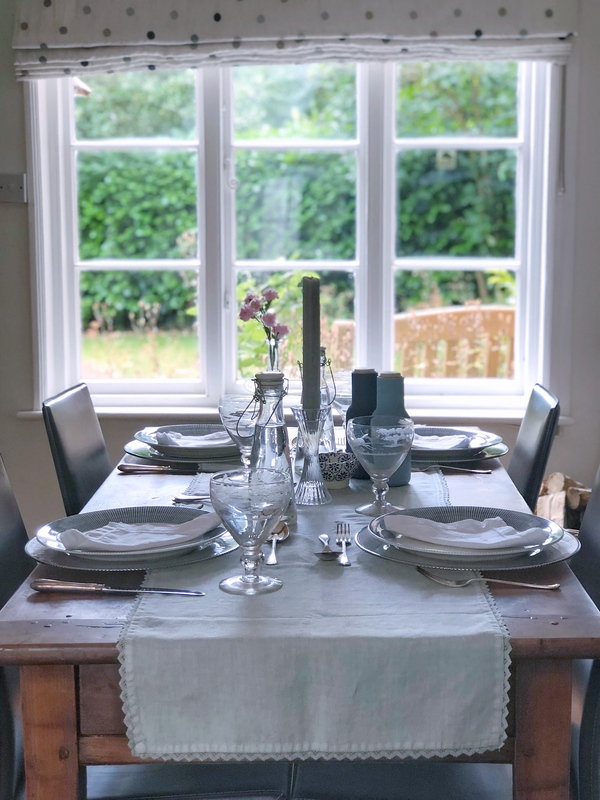 Naomi has allowed the imperfect perfections of years gone by to shine through with Grove Cottage enhancing the architectural delights that have withstood the test of time. 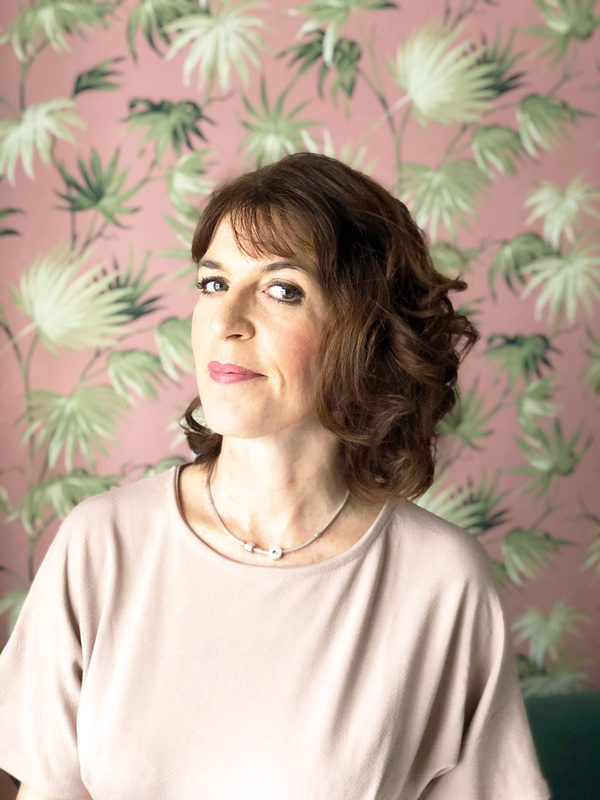 Naomi is a freelance copywriter based in the beautiful countryside of Buckinghamshire. 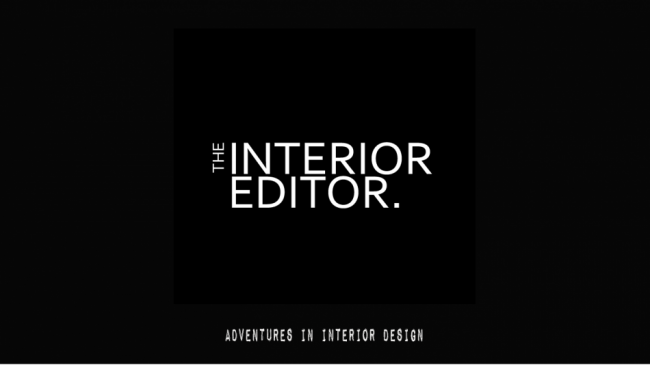 It’s where she writes engaging copy for websites, marketing collateral and blogs. So if you’re ever in the need of these services do check her out here. Naomi also runs two other notable businesses: one with her other half called Snowbility that provides one-to-one snow sports coaching to people with additional needs and mental challenges, and the other, a charity called The Snow Sports Foundation, with a Board of Trustees (all of whom are voluntary, including herself)! Their aim is to raise funds to give people with additional needs and disabilities the opportunity to develop their life and social skills through skiing and snowboarding. 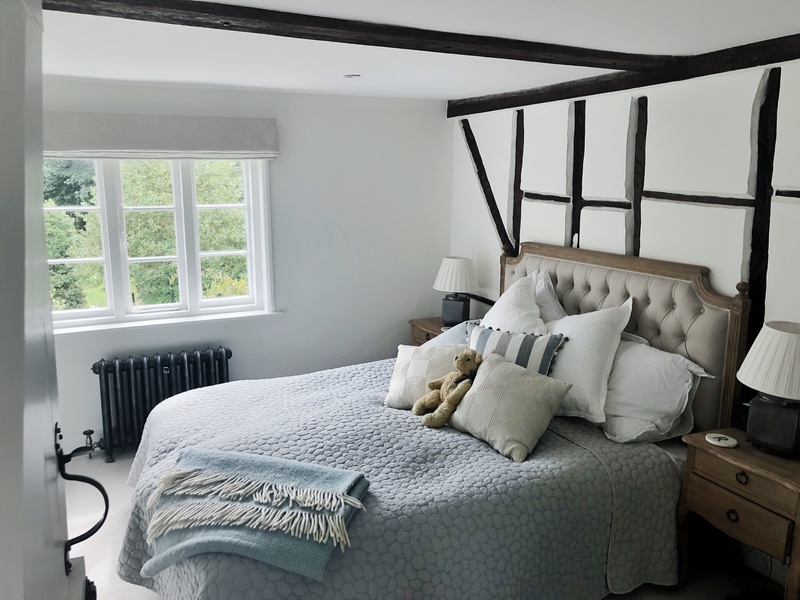 Apart from writing and skiing, her other passion is interior design and it shines through with her home, Grove Cottage. 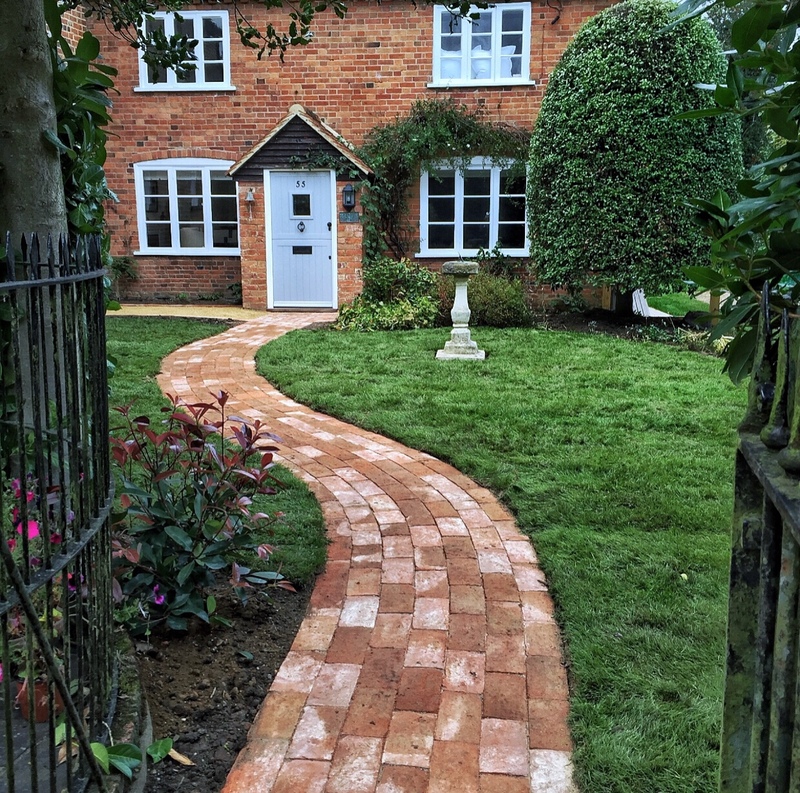 A former Minister’s home Grove Cottage is a 200-year-old country property set in the conservation area of a pretty Buckinghamshire village called Aston Abbotts. 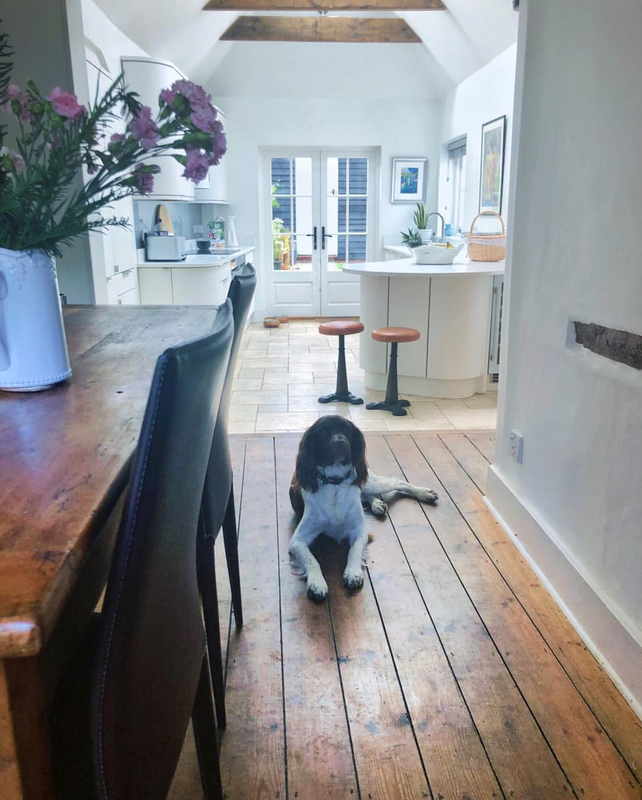 Naomi shares her life with her other half, Springer Spaniel, Radley, and two rescue cats, Poppy and Jasper. Tucked away down a gravel drive, Grove Cottage actually offers a deceptively spacious accommodation. There’s also purpose-built, detached office in the garden which provides a place for Naomi to work. Which, if you can afford and have the space to, is a great way to separate home and work life. Although the interiors were pleasant, it was obvious the cottage had been stripped of some of its original beauty. Naomi and her partner certainly had her work cut out for her. The problem, if you see it as one, is that older period properties will have endured and been at the behest of those that have lived there previously. Depending on whether they’ve maintained the property in all it’s entirety you can be taking on a lot more than you expected. 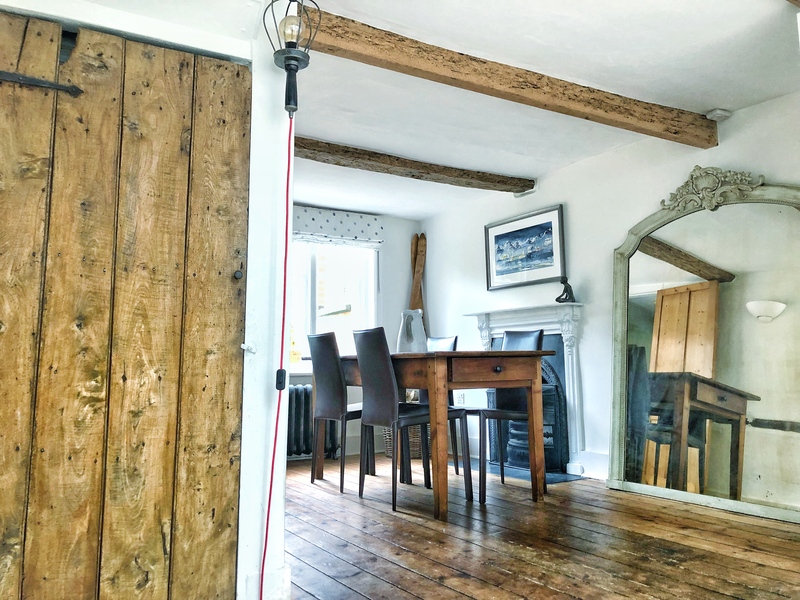 Apprehensive about removing the numerous mishmash of floor coverings, that included different coloured carpets to stained, dark brown floorboards, Naomi revealed these stunning original floorboards. Considering their age, they were in pretty good condition. I personally love old floorboards in period properties. 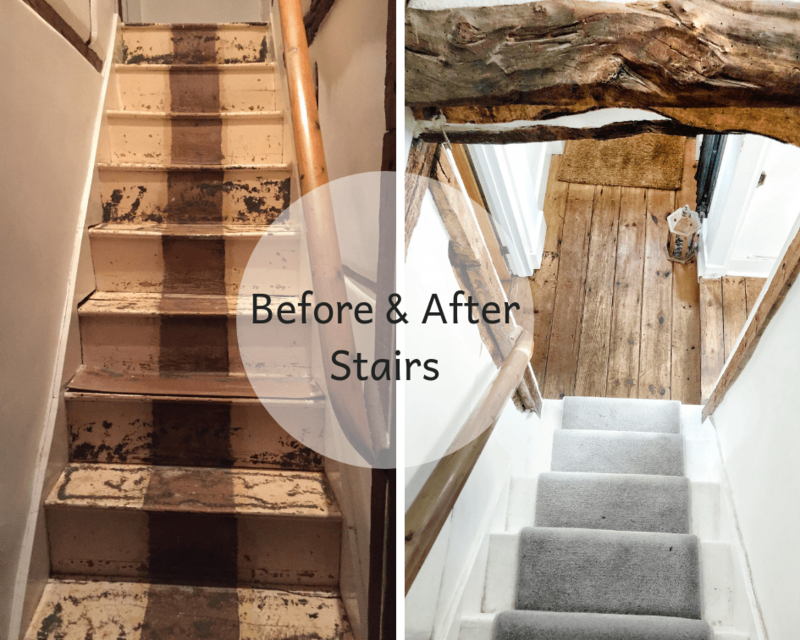 For the floorboards and beams, Naomi decided to remove the dark stain by hand-scraping them using a strong paint remover. They were then lightly hand-sanded with wire wool to retain the original Victorian look and protected using Danish oil. On the stairs, there were a couple that had thin plywood tacked onto the top which was acting as supports. 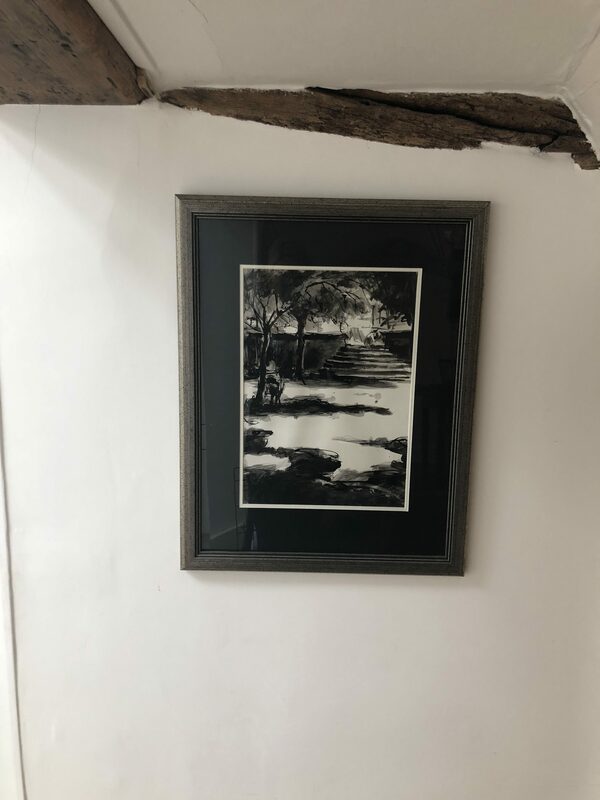 To rectify this, marine plywood plinths were screwed into the support joists in the cupboard under the stairs, creating a strengthened foundation. I’m sure you’ll agree with me when I say how fabulous these stairs look now. A flower anaglypta design wallpaper covered most of the walls. When it came to removing the wallpaper, there were five different coloured layers, some of which had been painted over. 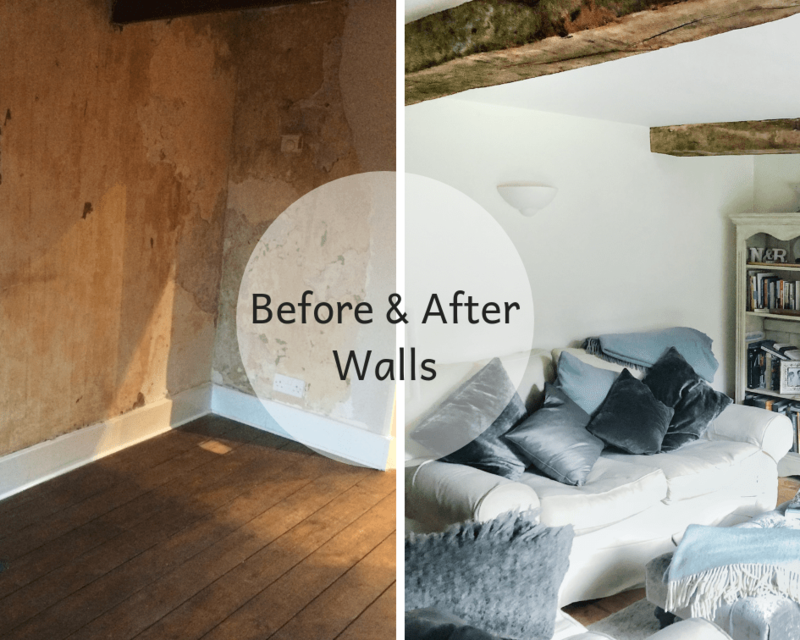 Using a wallpaper steamer and long-handled stripping knife, Naomi and her partner painstakingly spent hours eventually revealing the original walls which, luckily, were sound. They even found a small beam that had been covered up. The small beam Naomi unearthed after removing decades of wallpaper! The next stage was to sand all the walls to ensure every small piece of paper had been removed before the plasterer came in to do his magic. Once the plaster had dried, the walls needed to be sanded again to remove any unwanted cement. The undercoat paint was applied and then sanded a third time to create a beautifully smooth canvas for the top coats. For the walls, they opted for Wimbourne White by Farrow & Ball, a versatile shade which is a little softer and warmer than a pure white. With all the walls painted in this shade, Naomi has allowed the cottage’s beauty to shine through as well as creating a feeling of space and light. For the skirting boards, they chose a white eggshell as opposed to gloss, as they felt this was more in keeping for a period property. When it came to the radiators, they took out the standard white ones in each room, opting for a timeless, curved cast iron design in grey. Not only are they aesthetically pleasing but they give out far more energy-efficient heat. 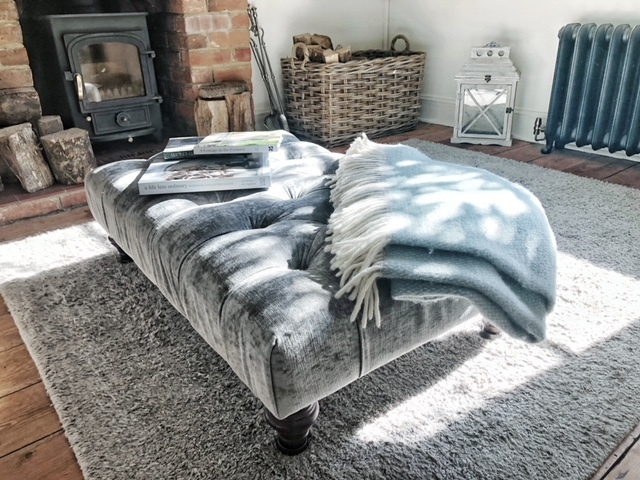 I adore all the textures that Naomi has used to create a wonderful cosy and inviting home. 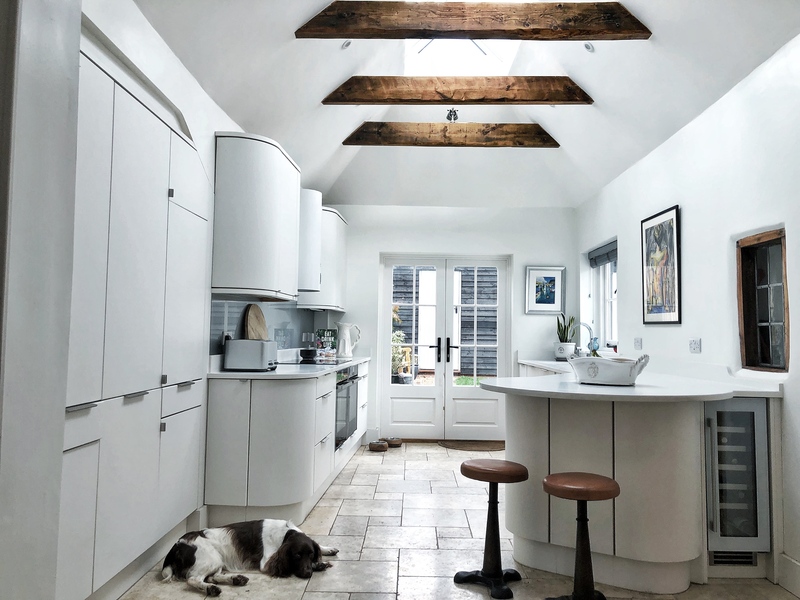 The tired-looking kitchen was completely stripped out, providing a blank canvas to welcome a contemporary, streamlined and functional cooking, eating and working space with French doors into the garden. Wet under-floor heating was added to bring a cosy, warm atmosphere to the room, which was then topped with tumbled limestone. The space has a vaulted ceiling and glass apex with exposed beams, providing amazing height and light into the kitchen. Previous owners had installed a fireplace that was out of proportion to the size of the dining room area. 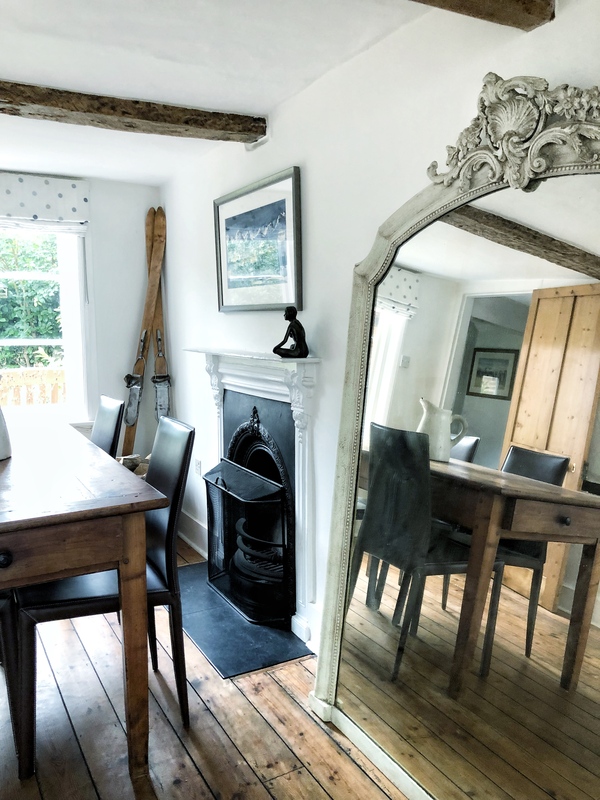 Naomi had this replaced with a much smaller original cast iron Victorian fireplace that sets off the room beautifully. Tip: When choosing feature pieces such as fireplaces for a period property (or any property for that matter) consider the size of the room you are going to be installing it. Scale and proportion are important to get right when it comes to reinstating period features. Of course, you can go larger if you wish to make a statement, but the room has to be large enough to allow it to not be overbearing. You don’t want it to be all fireplace and no room. The opposite can be said about mirrors. Using oversized mirrors, especially freestanding floor designs like the one Naomi has used helps create a sense of space as light is reflected and bounced around the room. Mirrors are your secret weapon when you want to create the illusion of space. The stable doors Naomi and her partner installed certainly add to the character of the cottage’s aesthetic as well as being practical. Stable doors were one of the projects that Naomi undertook. They’re great at allowing extra light to enter the cottage as well as catching those beautiful garden views. Perfect for summer days and particularly great if you have dogs as you’ll have peace of mind of where they are. To allow more light to enter the property Naomi opted for beautiful fabric blinds instead of long curtains. Tip: If you want to show off your windows and view then opt for the likes of roman blinds like Naomi has. Curtains take up room either side of a window and will partially block light and the window itself. Choosing fabric blinds will allow you to see the window and the view beyond in its entirety and they’re decorative too. 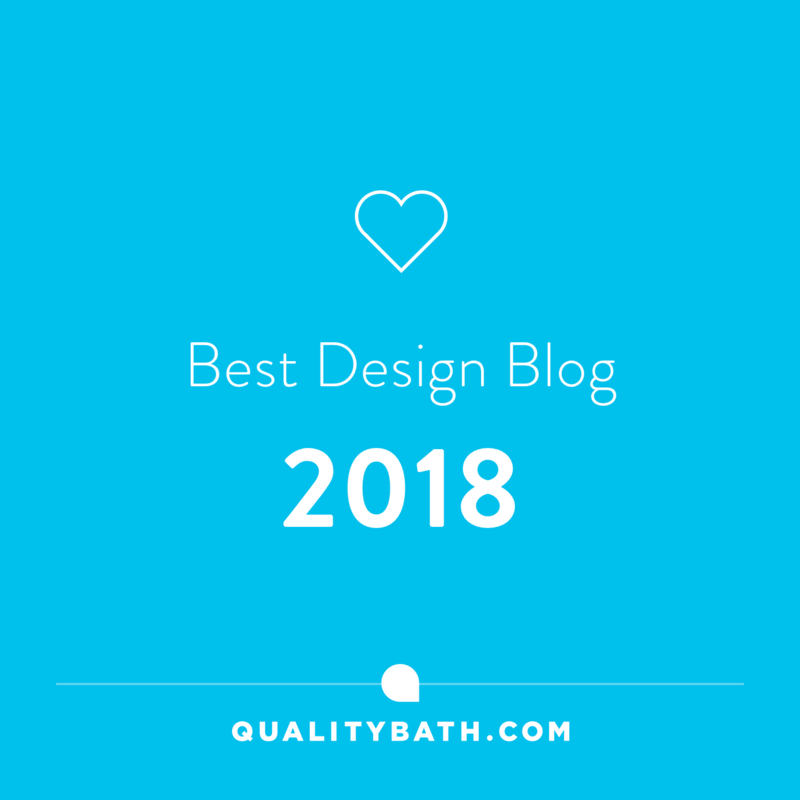 Naomi will be changing their downstairs bathroom space to suit the rest of her home in terms of style and look. 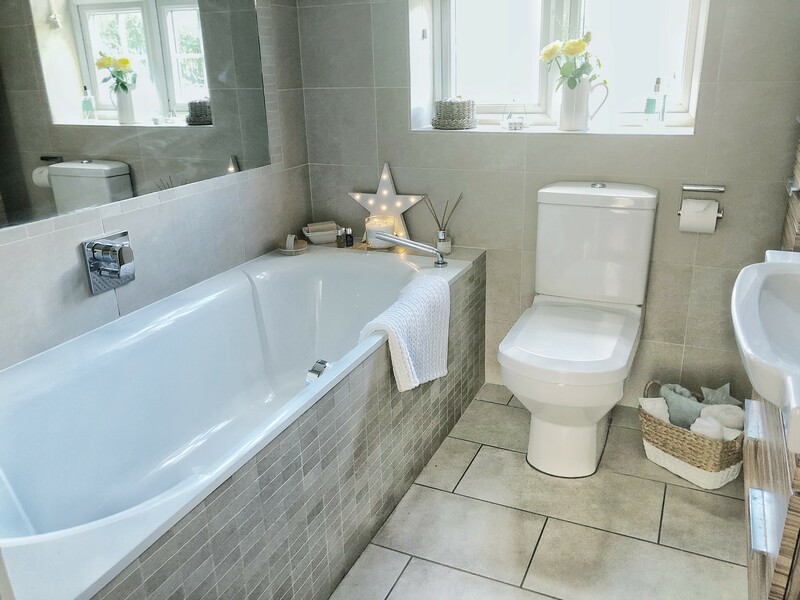 The layout of the cottage provided a downstairs bathroom, but Naomi and her partner wanted to add one upstairs too. As with any period property planning permission is a must. 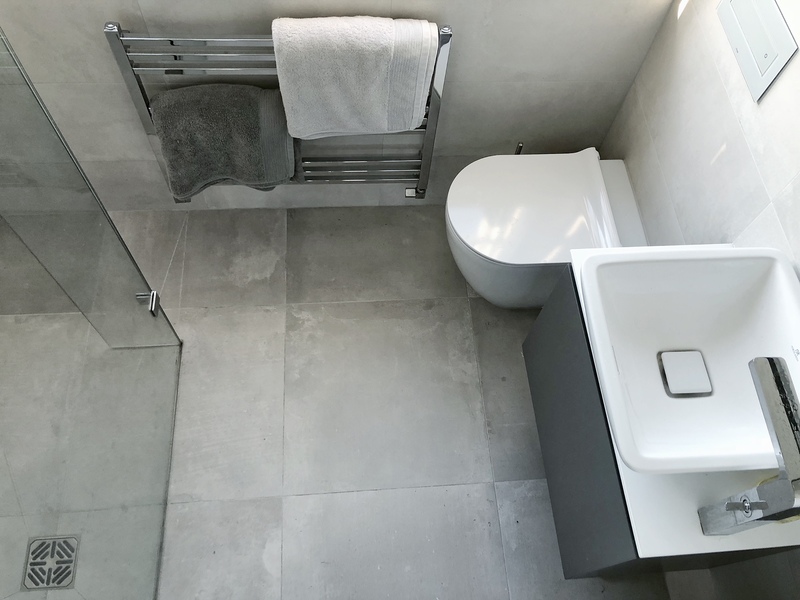 Naomi was granted permission to build a double-dormer window to the master bedroom to give a high-end, contemporary en-suite wet room with toilet and washbasin. You can find Naomi’s Insta page here if you’d like to see more of her beautiful home. 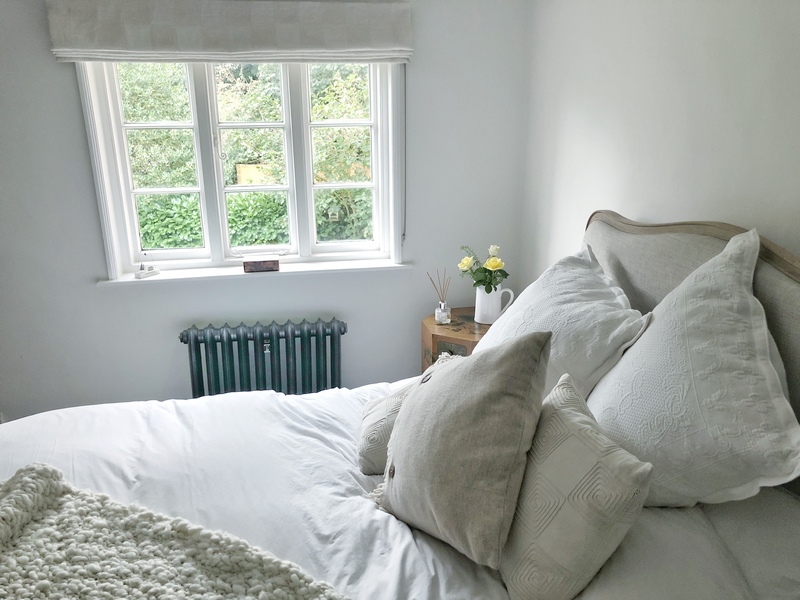 I think you’ll agree with me that Naomi has transformed their home into one that is welcoming, cosy and full of light whilst allowing its architectural qualities to shine through! I’m loving the kitchen and those beams!! !